Is performance only a series of compulsive moves made by a performer or a strange story told with the use of attributes and gestures deprived of their original intended meaning? Or is it a parallel world to which artists take their viewers with the view of staying there together for a short while and providing an opportunity to leave the world with a set of new experiences, thoughts and perhaps even emotions? 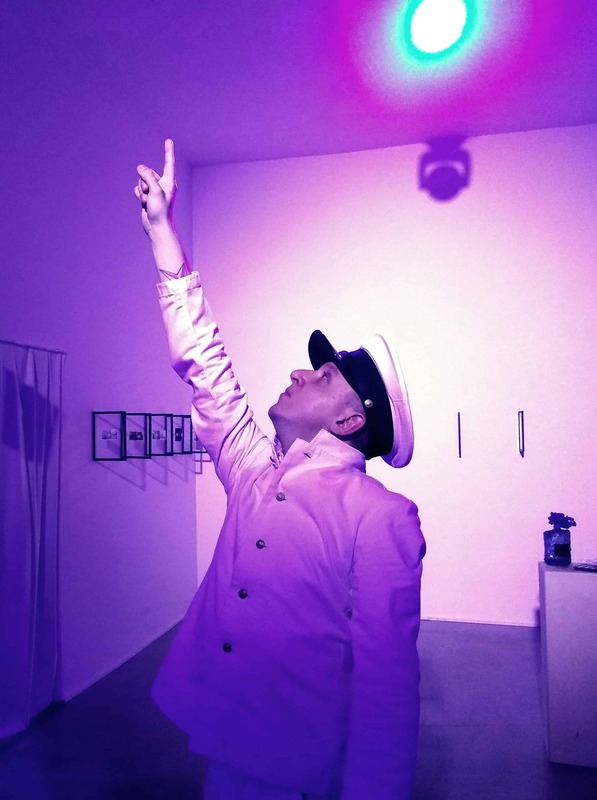 The Gdańsk City Gallery is currently showing a performance exhibition titled “I WANNA BE YOUR COLONIZER” by Przemek Branas. He is a young performer and visual artist who often uses matter and objects in his works, to which he adds a new value, while at the same time focusing on topical social and sociological issues, as well as on their private dimensions. Branas often incorporates a play on time, he places social conventions, creates stories and a new order of things accompanying the stories. I would not consider the exhibition outstanding, but it is certainly worth noting its extraordinarily meticulous preparation. Here, life merges with performance. 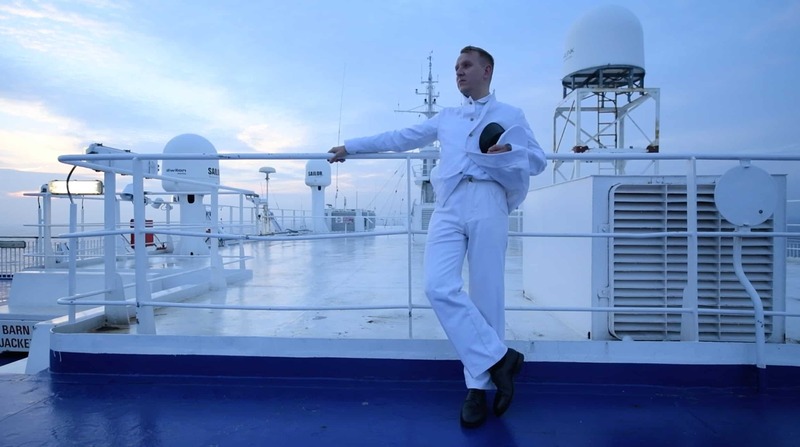 Przemek Branas, an artist from Podkarpacie region in the south of Poland, arrives in Pomerania, moors his boat as a sailor, and similarly to living statue performers, and invites visitors to participate. Who is the character Branas is attempting to play, who is the sailor? During the exhibition in Gdańsk, the artist seems to unwittingly discuss the issue of the performativity of cultural events and the methods of their creation. Just several years ago, he was excluded from the best diploma work competition organised by the nearby Academy of Fine Arts for discussing the subject. Although Branas was nominated as a competition participant, the jury found that his live performance was in breach of the terms and conditions, and the structure, of this academic competition. The performance artist himself becomes an integral part of his operations during the “I WANNA BE YOUR COLONIZER” exhibition. It is not an actor who is asked to take an assigned role after a series of workshops; it is Branas himself. 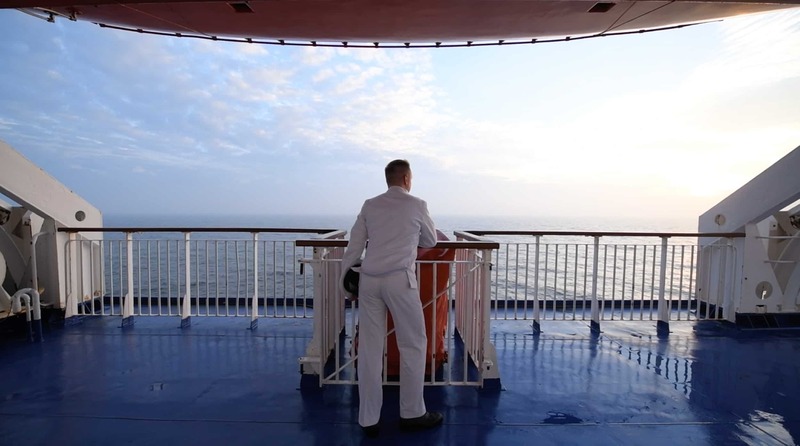 Starting from the opening night, through the whole duration of the exhibition, the artist comes to the gallery every day for three hours and becomes a sailor, a protagonists who is at the centre of the entire exhibition. On entering the gallery, the first thing which strike us is a bright blue light, followed by a scent, while our eyes quickly turn to the corner of a small hall, where we can see a figure in a white jacket lying on the floor. The minute we enter the gallery we are momentarily transported to a parallel reality. The person in the white jacket, trousers and sailor’s cap is of course Branas himself. Why did the artist choose such an outfit? The answer to this question is in fact the key point of the exhibition, from which Branas started to develop the entire story. According to the description of the exhibition, one day the artists found a series of 12 photographs in the shop located in his hometown in Podkarpacie. The photos came to Poland by accident, hidden in Dutch furniture. The photos date back to the 1930s, and they were taken in Curacao, which was a Dutch colony at the time. 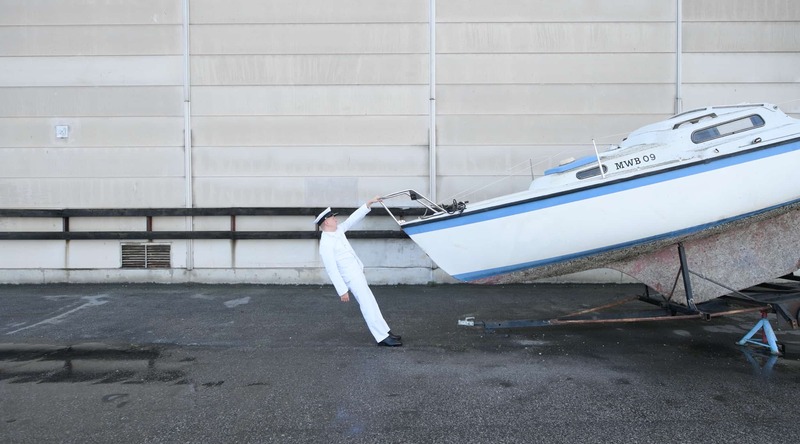 Each of the photos, which are presented at the gallery, shows a sailor, a figure that Branas has been trying to recreate while preparing the exhibition. As it is almost impossible to identify the man in the photographs, the artist began his works by building the character by accurately reconstructing his appearance. He reconstructed his outfit, after which he created a portrait of his personality based on a graphological analysis of the notes of places in the photos. He also created a perfume scent the sailor could have been using. The entire exhibition includes literally several artefacts that at first sight seem trivial. They are objects that the artists prepared on the basis of the photograph series he had found. He also used the strategy in his earlier activities. Photographs that had been found by accident would become a starting point for developing the entire work. Time has stopped here, and the present day merges with the past. Both here in Gdańsk and during his earlier exhibitions, Branas uses masks to shift situations and build a character. The “I WANNA BE YOUR COLONIZER” exhibition features a lightbox with a tattooed figure wearing a mask, which is the reconstruction of the person in the photographs. Branas covers his entire face with the mask, using his body as a kind of a medium. The atmosphere that Branas created at the gallery acts on the viewers’ imagination. The lights, the scent, the authentic photographs and his presence make this short visit to the gallery a strong and strangely exciting experience. It can be said that Branas is creating a never-ending mockumentary, which can be watched like a TV series upon entering the gallery. The artist builds a character on the basis of real-life events, yet with a hint of grotesque distance. 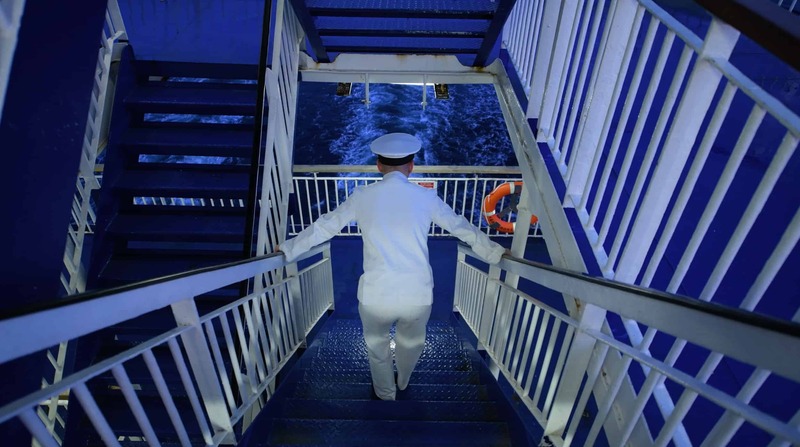 He moves around the gallery as if he were in lethargy, allowing the viewers to imagine that he is a sailor standing at the bridge of a ship, watching for land or looking at a starry sky. Without paying attention to the viewers, he only makes a few inconspicuous gestures, creating an atmosphere of anticipation, as if we were waiting for something to happen. But it never does, and life follows its natural course. Although Branas is physically present in the exhibition and his figure is merged with the sailor character, he is neither of them. He remains an anonymous person, and that is the story he tries to tell us in “I WANNA BE YOUR COLONIZER”. It’s an attempt to shift our attention to human beings. The graphological and psychological analysis of the photographs was aimed at recreating the sailor’s personality traits. We can learn what kind of person he could be. Was he easily carried away by euphoria, passion or jealousy? Was he carried away by emotions, or did he evoke emotions in others? Did he really have extensive emotional needs? Was he really impatient? A lot of these characteristics can be assigned to everyone. To me, it is a tragic story shown though the iconic character of a sailor. A dreamer who is lost on his quest to find the great world, but is on the road leading nowhere, and whose story remains unknown. The sailor is only a figure with access to a series of repeated gestures, words and possibilities. The “I WANNA BE YOUR COLONIZER” exhibition is an attempt to show the schematic nature of human behaviour, choices and the inevitability of our fate that is difficult to overcome even to an experienced sea dog, as we all travel along pre-defined routes.